Some of the most celestial, intricately textured electronic ambience ever to come out of the original Californian new age scene...the synth sounds are very distinctive, lush without being overly glossy. Greek-born composer and new age music icon Iasos has roots firmly in the Californian new age movement of the 1970's and early 80's; a world of crystals, chakras, environmentalism and elevation of consciousness through music. 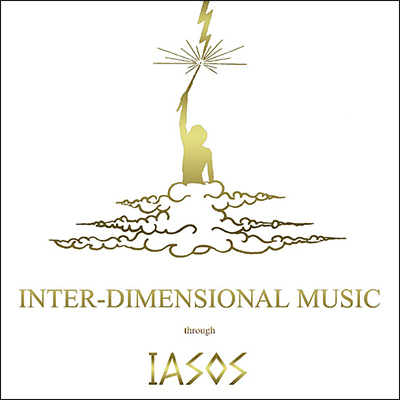 Along with the mostly unexceptional music of Steven Halpern, Iasos' music was among the earliest electronica to be sold as "healing music", with the sleeve notes on many Iasos albums famous for their incomprehensible new age gobbledygook. Yet compared to Halpern, Iasos was always distinctively different and his music was far more interesting. He has always maintained that he's a transmitter of music from somewhere else - a common enough statement by musicians when asked how they create - but he's far more specific about it than most. He says that he synthesises music played to him from other dimensions, serving as an Earth transmission point for inter-dimensional beings. Now, he has being saying this for so long that I see no reason to doubt his sincerity. And whether you believe him or not is really beside the point because - on his early albums at least - Iasos has fashioned a totally unique sound and the musical results speak for themselves. The debut album Inter-Dimensional Music (1975) is actually quite wildly experimental - a progressive concoction of analog synth textures, flutes, piano, percussion and environmental recordings. Some tracks are astonishingly intricate with complex, jazzy chord changes, morphing time signatures and echoes of 60's bachelor pad music. The music literally sparkles with life and light. It's like nothing else from the 1970's and really does sound like music from another place, or other dimension if you will. Music journalist and historian Douglas Mcgowan, in his notes to the excellent new age retrospective album I Am The Centre (2013), has called Iasos' debut "one of the most startling musical debuts ever...I would go so far as to say that posterity will gradually reveal this former Bay Area dollar bin staple as one of the 20th century's most significant works of music." Iasos developed his sound further on Angelic Music (1978) and Elixir (1983) which contain some of the most celestial, intricately textured electronic ambience ever to come out of the original Californian new age scene. Again, the synth sounds are very distinctive, lush without being overly glossy. While nowadays these albums may sound a little quaint or a tad cheesy at times, many of the tracks like "The Angels Of Comfort" and "The Decent Of Spring" are genuinely deep and uniquely beautiful. For newcomers, these two early albums plus Inter-Dimensional Music are the ones to get; the rest of his discography is best left for devoted fans. "Some people say it's a dichotomy that I'm trying to create organic nature music and yet I'm using all these electronics. What could me more organic than electrons? What do you think a flower's made of? I think of electrons as these very, very sensitive God-beings that are extremely sensitive to consciousness and are just rushing - literally at the speed of light - just to fulfill your will. All these wires are creating different paths. You tell the electrons which way you want them to go, and they jump at the chance to serve. They go exactly where you want them to. So I think of them as my joyous little servants."